I try to find every excuse I can to go to Disneyland, so when my two younger children were given the opportunity to perform there with their ballroom dance company we were happy to sign up. We have yet to ever visit Disneyland in the summer. We nearly always go right before major holidays before peak business or during the off season. We are petrified of suffocating crowds, long lines, and hot temperatures. But I must say, early June is perfect! The crowds were manageable for the most part, the temperatures were absolutely perfect, and the live performances and characters have a much stronger presence. Everywhere you go there is live music and opportunities to meet characters, some of which are difficult to catch off-season. 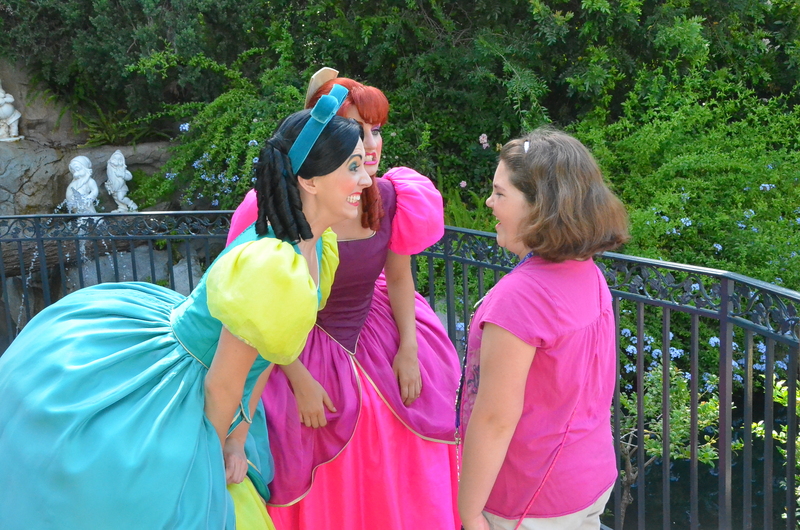 The characters are so fantastic with guests. 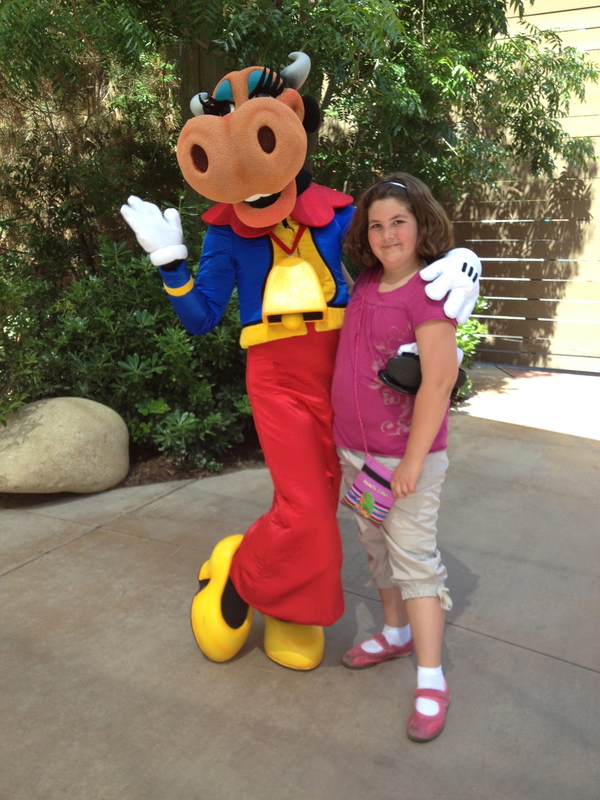 We have always had a good experience and they really add to the Disney charm. 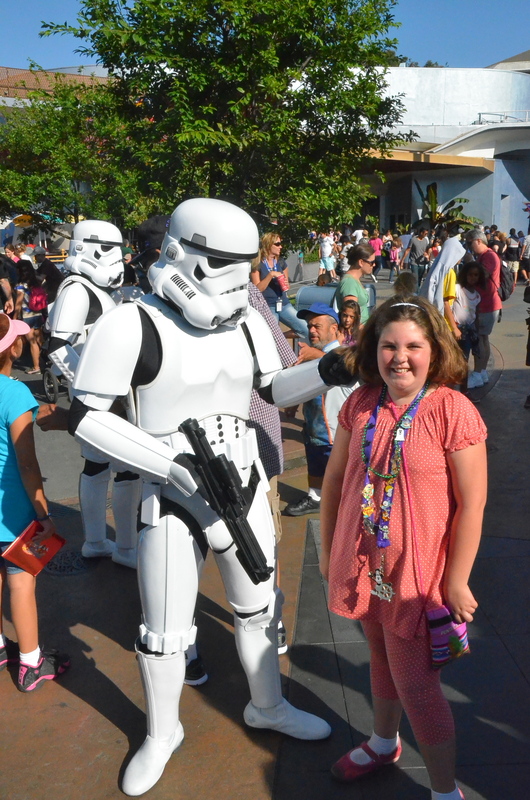 A pesky Storm Trooper being a pill and messing with my youngest’s hair. 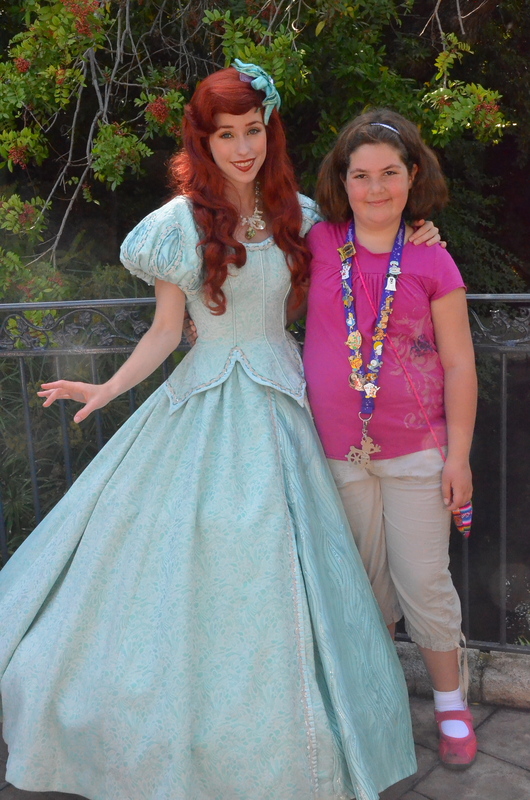 Ariel over by the Snow White wishing well. 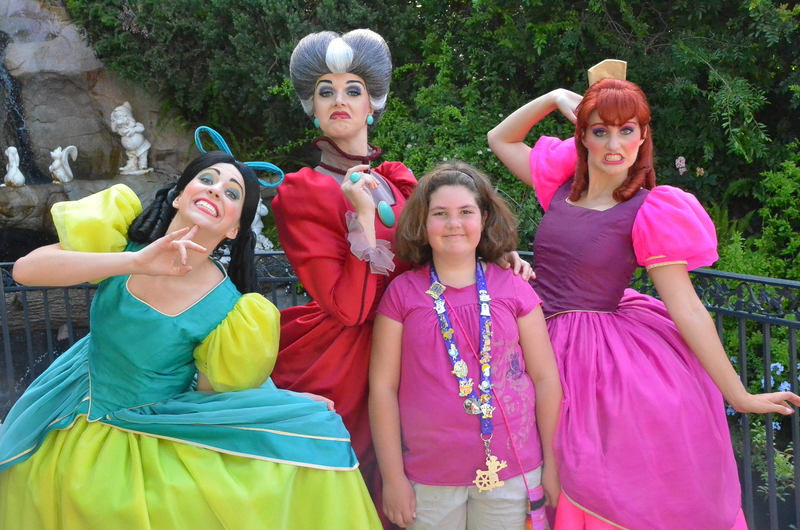 One morning the kids were so excited to stumble upon Cinderella’s ugly stepsisters and evil stepmother. The “evil” characters are such a kick because they seem to have more flexibility in what they can say and how they can interact. They were trying to get my youngest to tell them what was the matter with their smiles. A new place we discovered at Disneyland is the brand new performing arts stage area behind Big Thunder Ranch. It is open and beautiful, and features guest performers throughout the day. There are picnic tables set up everywhere with papers and crayons for anyone who would like to use them between shows. It was especially nice because it was uncrowded and quiet, and chuck-full of characters. 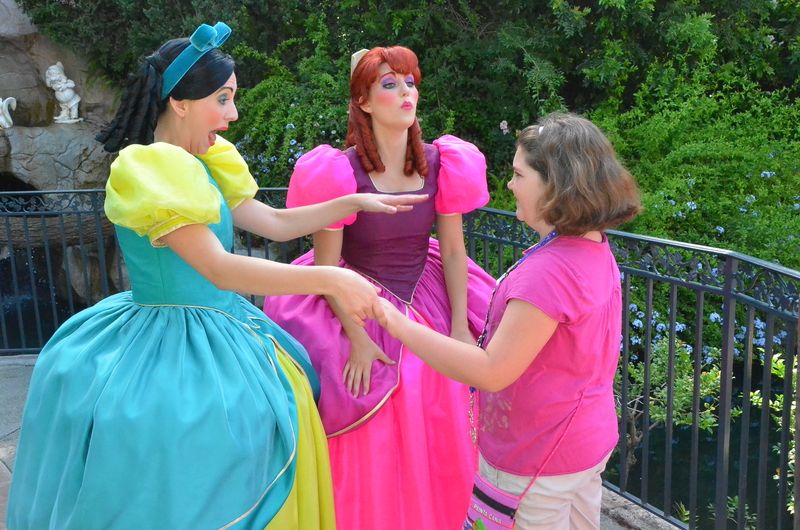 We even saw a character congo line headed up by a sweet girl who had obvious disabilities. Goofy sat at a nearby table and colored with a young boy who had Down’s Syndrome for over twenty minutes. It was a relaxing and fun atmosphere. It was here that my youngest managed to nab one of the more rare characters. One of the best things about Disneyland, in our opinion, is all the opportunities to enjoy live music throughout the park. Most people just walk on by without even stopping to listen! It is such a pity, because they are excellent musicians who are great entertainers as well. If you blast past this you are missing what makes Disneyland a cut above other amusement parks. 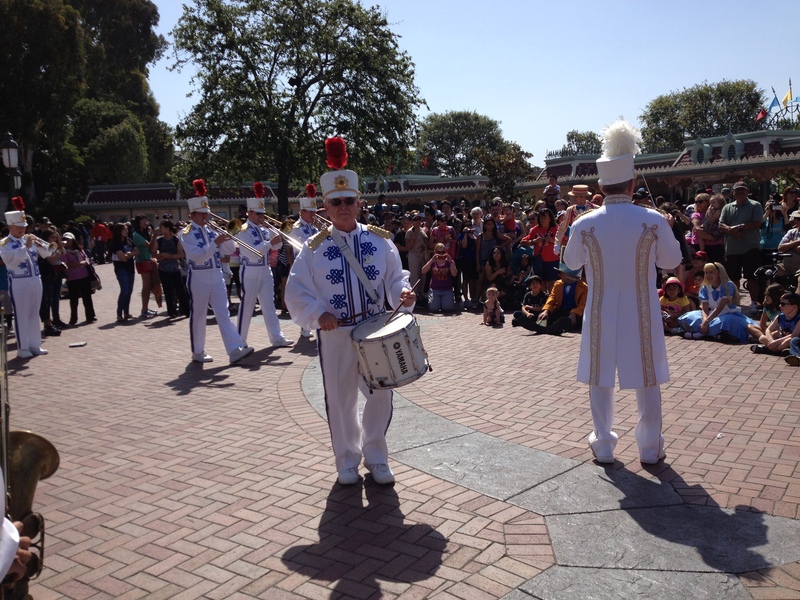 We try to catch the Disneyland Band whenever we can. The same gentlemen have been performing here with the band for decades! They are charming and personable, and chat companionably with guests. He walked right over to me and had me beat out a few measures for them. 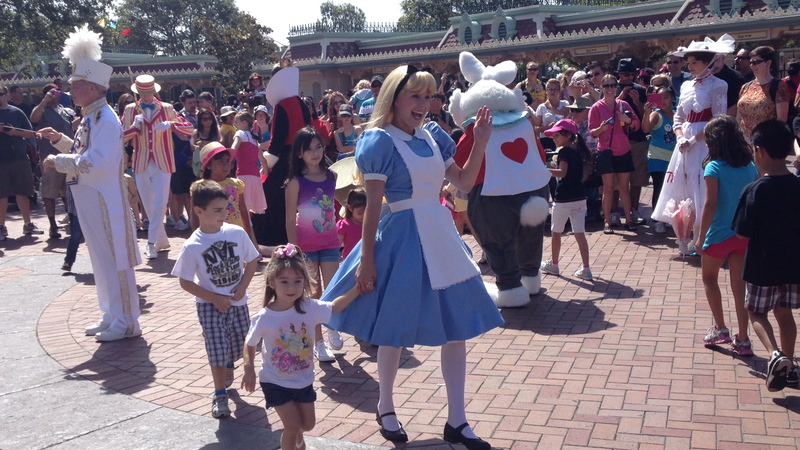 Alice, the Mad Hatter, the White Rabbit, the Queen of Hearts, Bert and Mary Poppins lead the children in a little parade. 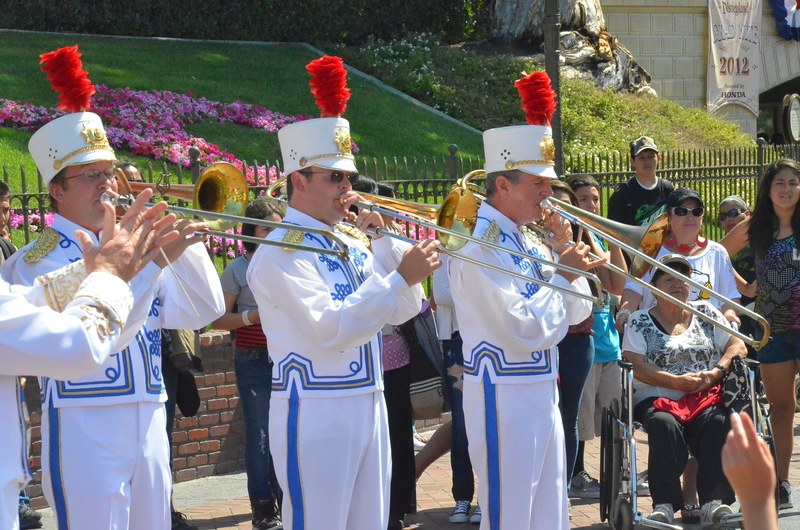 You can catch the Disneyland Band in front of Sleeping Beauty’s castle and at the entrance at varying times of the day. 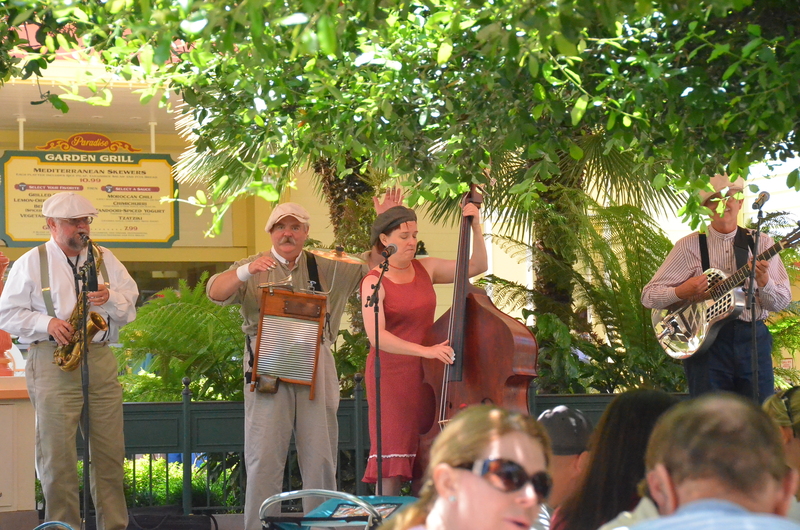 We love to be enjoying a leisurely breakfast at Carnation Cafe and hear the band go by. 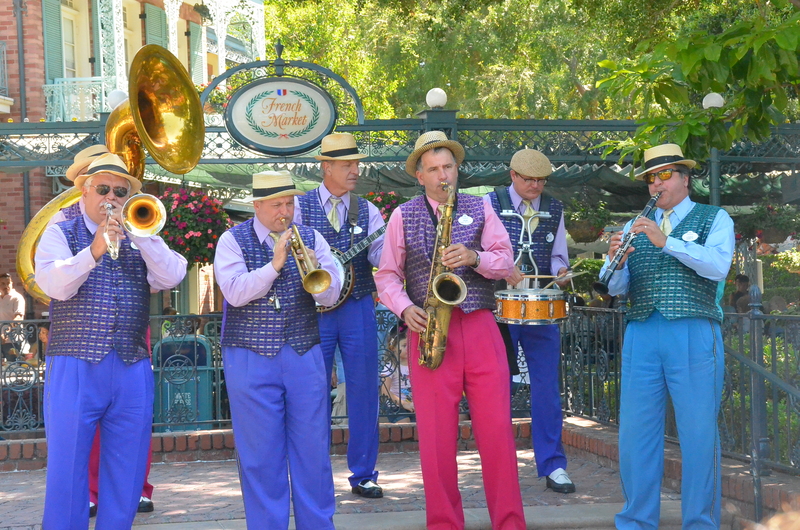 Another favorite group of ours is the Royal Street Bachelors who perform off and on all day in New Orleans Square. They play Dixieland and will sometimes randomly throw Mardi-Gras bling in the form of necklaces at devoted fans. One time they threw one at my daughter as they were walking by and it literally landed on her head and wound about until it was where a necklace should be if you put it on yourself. This time we brought a friend with us who had a birthday during the trip, and the Royal Street Bachelors played Happy Birthday just for her. They also play sets inside the French Market during the day. It is lovely to enjoy a mint julep and Mickey Mouse Beignets while you relax to the music. Over in California Adventure, in the new Paradise Garden Grill (by the way, they have delicious Mediterranean plates there for just a bit over $10), there is live music all day. The groups are fantastic and seem to mostly have a World Music influence. Again, excellent musicians. It is our favorite place to hang in California Adventure. We love this group. It is a perfect place to rest your feet and get some lunch. 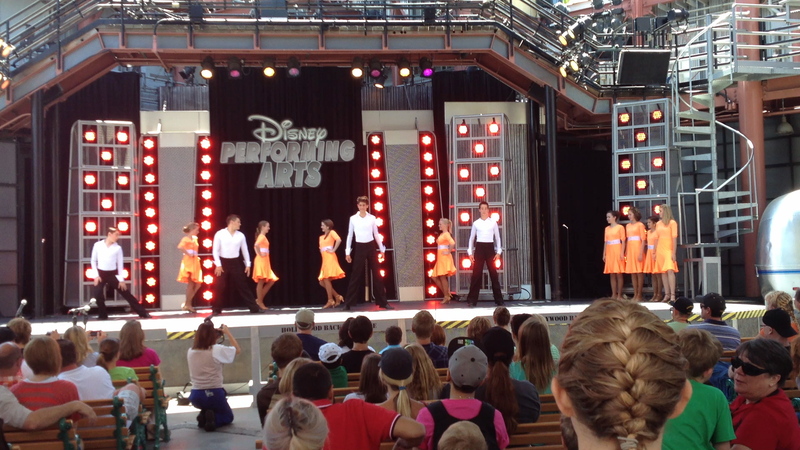 In California Adventure, over by the Hollywood Backlot and the Monster’s Inc. ride, there is a stage reserved for guest performers. This is where the ballroom group performed. My son is the tall one in the middle! Having never been there in the summer, we hadn’t had the opportunity to see the “Magical” fireworks. 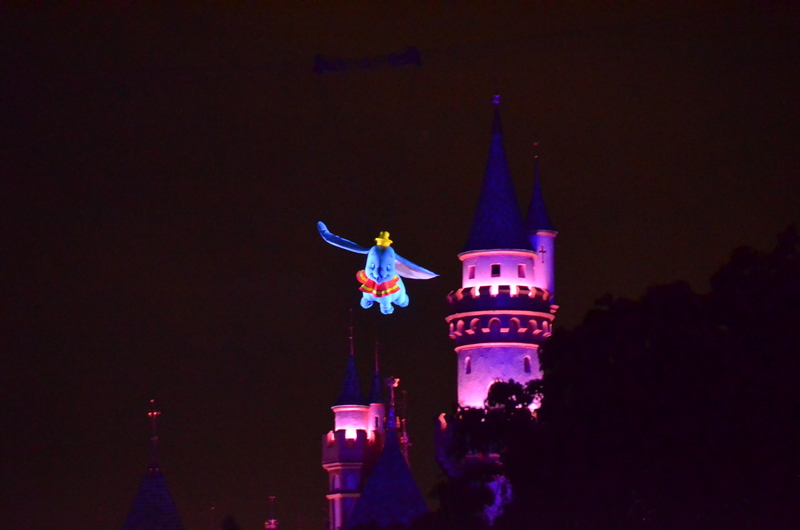 As my older daughter stated, they are sure to cause “Disney Tears.” The music is both touching and fun, and after hearing the song “Baby Mine” from Dumbo, we were surprised to see an appearance in the sky of Dumbo himself. 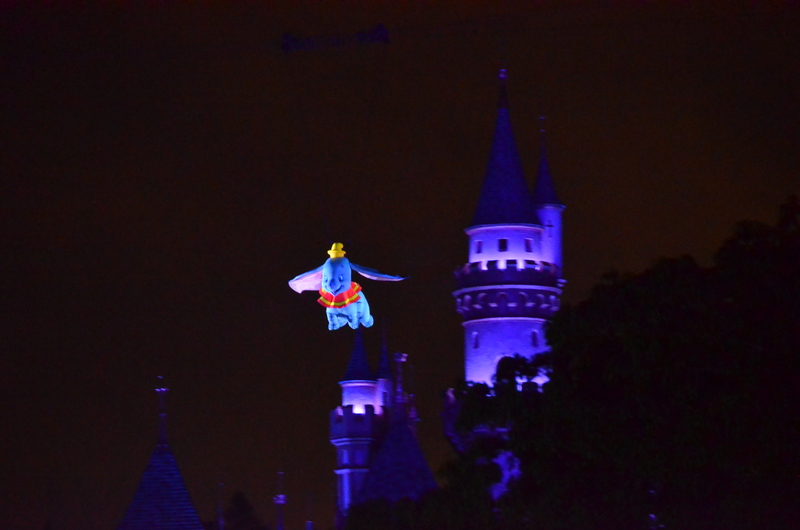 I have no idea how they rigged this, but he flapped his ears and floated all over in the sky above the castle. Every time I think I might have seen it all, the Imagineers at Disneyland manage to surprise me. My husband’s new telephoto lens he got for graduating with his doctorate (yes, you heard me!!!! WOWWEEEE) took fantastic pictures. Actually, I should say HE took fantastic pictures with his new lens. I am no longer afraid to visit Disneyland in the summer. As far as weather is concerned, we will never have to again survive what we did a few years ago when it was 113 in the park in October. Yes, October! Even in the summer in California, after the sun sets the evenings are cool. And all of the additional characters and the music makes up for the longer wait times in the lines. All in all, it was a lovely trip.